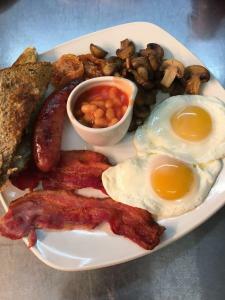 In the charming Oxfordshire village of Cuddesdon, The Bat & Ball Inn is a former traveler's inn offering refurbished rooms and home-cooked food, a 15 minute drive from Oxford. 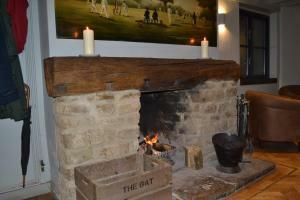 Refurbished in a contemporary style, each room at The Bat & Ball Inn are named after famous cricketers and boast exposed oak beams and private bathrooms. Each room also features an LCD TV, solid oak furniture, and tea/coffee facilities. A seasonal menu is served in the restaurant for lunch or dinner along with a specials board. Guests can also enjoy views of the patio while dining. 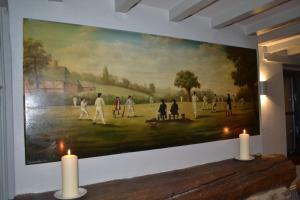 Decorated with cricketing memorabilia, flagstone floors, and an open log fire, the bar offers a wide range of specialist hand-pulled ales and an in-house bitter. Free parking is available, and the A40 and M40 highway are easily accessible, just a 5 minute drive away. Blenheim Palace and Bicester Retail Village are a 25-minute drive away. The most recent booking for this hotel was made on Apr 20 at 15:47 from United Kingdom. These are general hotel policies for The Bat & Ball Inn. As they may vary per room type, please also check the room conditions. From m40: Exit motorway at junction 8a (The junction with the services on). Head east towards the a40 and as you reach the apex of the bend, you will see a road off to the right signed Wheatley. Turn down this way and follow the road for approx one mile, past Asda and Wheatley Car Sales. 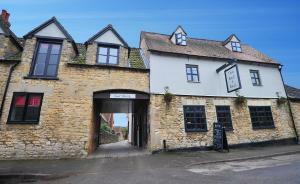 You will come to a pub called The Kings Arms, you need to turn left here (where the road forks). Follow this road for approx one mile until you reach a crossroads. (There is a churchyard opposite on the right at this junction) Turn left down a steep hill. At the bottom of this hill, go across the staggered junction. Proceed up the hill towards Garsington, passing a pub called The Railway on your right and a q8 filling station on your left. After approx one mile, you should see a turning on your left into Cuddesdon, we are in the centre of the village. FROM RING ROAD (A4142): Between Cowley and Headington (closer to Cowley) is Horspath Industrial estate. Turn up towards this estate and keep on the main road into Horspath (approx 1 miles). Continue through the village around nasty bend (you will find the Chequers pub on this bend) and out through village underneath rail bridge. Continue up this road up small hill for approx one mile. At the T-junction, turn left towards Wheatley and then first right into Cuddesdon, we are in the centre of the village. FROM SCIENCE PARK (Littlemore/Sandford Area): Turn left out of Science Park and drive to the main roundabout (approx 1 miles). Turn right onto the Watlington road. After about mile, turn right towards Garsington. At the junction, take the right hand fork and proceed towards Wheatley. After about 1 mile, look for the signpost on your right to Cuddesdon. We are about one mile down here in centre of village. Always look out for road signs as they are old fashioned, small and non-reflective. If you do have difficulty, call us and we will guide you in. The limited number of rooms that we have mean that we have a strictly enforced cancellation policy. Guests are therefore asked to ensure that they are confident about the dates for their visit prior to making a reservation, and that they obtain suitable travel insurance for the duration of their stay with us. Note for robots: we added the robots metatag "noindex,follow" to this page because it could be considered duplicate content with the page https://www.booking.com/hotel/gb/batandball.en-us.html which should be in the index.